With the swagger of menswear-inspired style and the glamour of silk, this versatile look goes from courtside seats to fashion parties. CrOp by David Peck Hatch dress, midnight reverse charmeuse longsleeve shirt dress with banded collar $280. The swagger of menswear-inspired style AND the glamour of a silk dress? 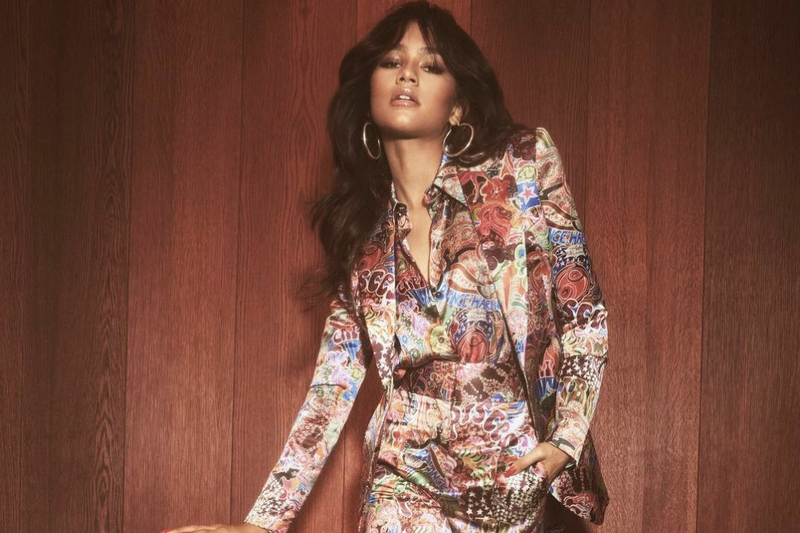 All hail the silk shirtdress. This MCQ by Alexander McQueen version ($545.83) is flawless. We also love this locally-made CrOp by David Peck Hatch dress ($280), with a banded-collar and gathered shoulders. Extra versatile in blue, the silk shirtdress can take you from the ball game to the symphony and to a hot night of fashion and music in between. It’s so effortless, you might even want to sleep in it. You never know when you might get caught on camera as you’re over- enthusiastically cheering on your favorite team, so you better have your game on! Imagine this dress as an oversized tee and pair with thigh-high boots and a cap. A utilitarian top layer will keep things from feeling too delicate, a definitive three-pointer that just might turn the game in your favor. Score. Clockwise from top left: MCQ by Alexander McQueen silk shirtdress; Elaine Turner Blair Bittersweet python crossbody bag, $328 at Elaine Turner; Fendi Diana over-the-knee boots, $2,150 at Neiman Marcus; Odette serpent necklace, $160, at Myth and Symbol in Rice Village. 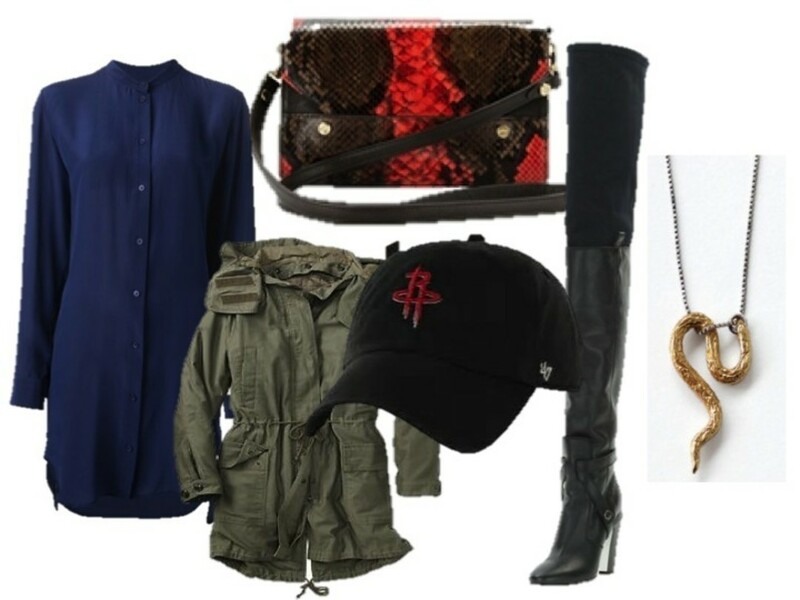 Rockets cap, $15.99 at Houston Rockets, Parka jacket, $168 at Gap. Amir Taghi and David Peck have hot collections at this year’s edition of Fashion Houston, so it’s only fitting that you show up wearing the CrOp Hatch dress. A furry bag adds just the right amount of seasonal texture and will carry your essentials as you head to the after-party, while the open-toe booties will keep your toes from getting crushed as you dance the night away. This modern-tribal take on the silk shirtdress dress might even get you into the VIP section. Clockwise from top left: Elista high-heel sandal, $375 at BCBG; Vintage Chanel bag, $2,950 at The Vintage Contessa, 6222 Richmond Ave.; Lizzie Fortunato 'Mountains and Sea' necklace, $598 at Saint Cloud in Rice Village. Close your eyes and imagine yourself as the heroine in a painfully romantic story as you spend your afternoon listening to the Houston Symphony’s masterful interpretations of Mozart’s Requiem and works by Beethoven at Jones Hall. Sober up the sassy shortness of the dress with opaque tights and a long coat, because you are as elegant, complex and layered as classical music. Clockwise from top left: Crystal cluster earrings, $29.50 at J.Crew; Jennifer Behr silk jersey headwrap, $250 at Saint Cloud; Topshop fur-collar coat, $790 at Nordstrom; Black and white Sac de Jour mini crossbody bag, $2,250at YSL in The Galleria; Givenchy suede shark-lock foldover ankle boot, $1,550 at Neiman Marcus.